I think there might be more than a billion cookie recipes out there. Perhaps that is a slight exaggeration, but there are more cookie recipes than you and I can make in our lifetimes. So thinking about the fact that there are zillions of cookie recipes at our fingertips, how come oatmeal cookies and chocolate chip cookies are the ones we always turn to? They’re at every bake sale, picnic, BBQ, bakery, and in every dream I have about eating a dozen cookies in one sitting. When I offer to bake homemade cookies for my family, what do you think they ask for? Yep! So instead of reinventing the wheel all the time, I decided to put a seasonal twist on my husband’s favorite, the classic oatmeal cookie. He absolutely loves blueberries and I add them regularly to his pancakes, waffles, oatmeal, yogurt parfaits and even salads. I thought, why not blueberries in cookies? It turns out these were a total winner! I taught these in a class a few years ago and everyone loved them. 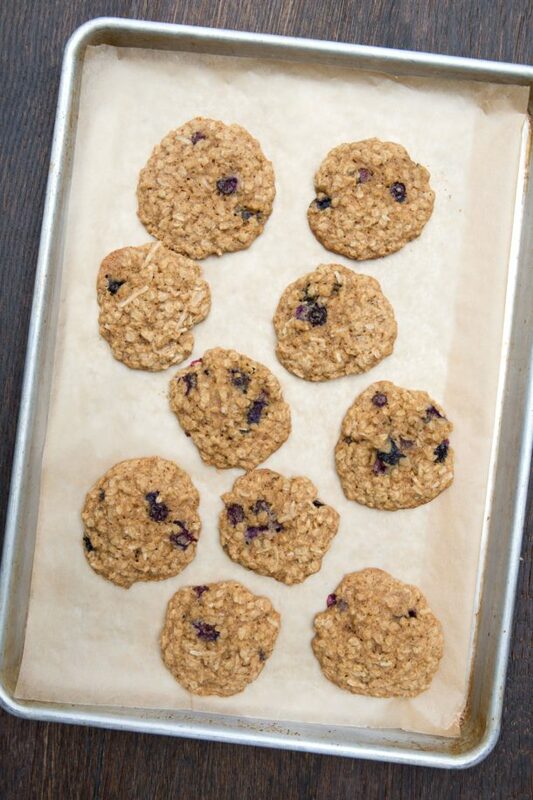 They’re not too sweet, crispy on the outside and chewy on the inside, and made with whole grains. I baked them two different ways — one with lemon zest, which I preferred, and one without. My kids, of course, preferred them without the lemon. 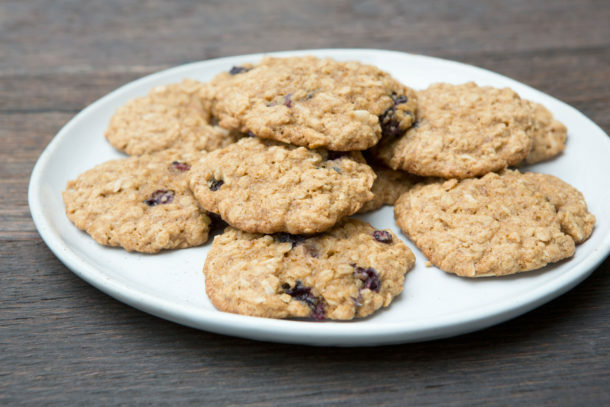 But I am here to tell you that an oatmeal cookie with fresh, burst blueberries is downright delicious and just the treat to make you feel like it’s really summer. 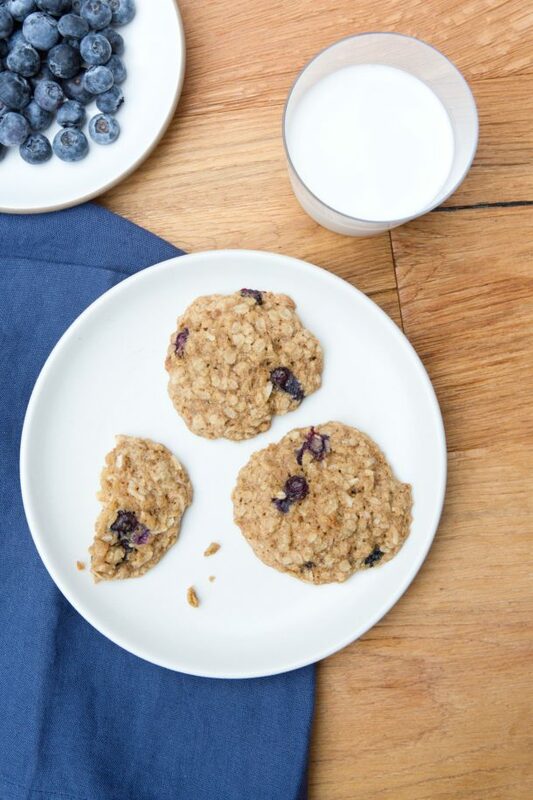 The downside of using fresh blueberries in a cookie is that the cookies get soft after a day. I did remedy that by taking these cookies two days after they were baked and putting them in the dehydrator to crisp them up again. I am sure the oven at 250 would do just as good of a job. But if you want the flavor of blueberries and these to last longer, you can absolutely use dried blueberries which worked great for me as well. And then you can have these when blueberries are out of season, too. Preheat oven to 375 degrees. Prepare two baking sheets with unbleached parchment paper. 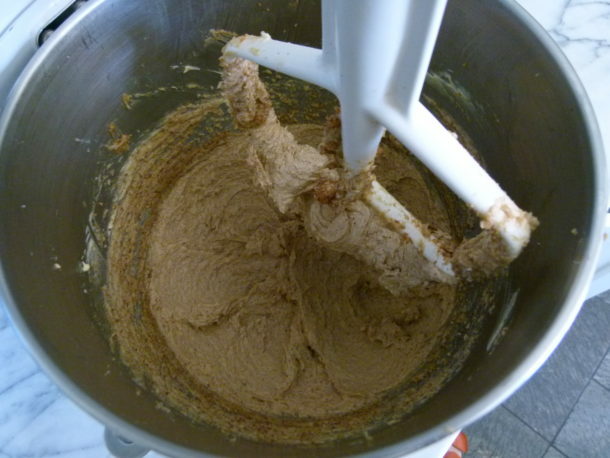 Cream the butter using a stand mixer or hand mixer. Add sugars and continue to cream until light and fluffy, about 4 minutes. Add egg and vanilla, cream until smooth and velvety. In a small bowl combine the flour, salt, ground cinnamon, and baking soda. Slowly add the flour mixture to the mixing bowl with the butter, stirring until well combined. 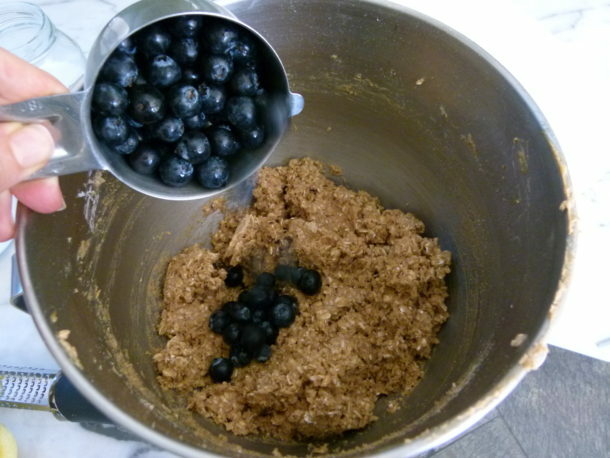 Remove bowl from mixer, and using a spatula add the oats and coconut. Fold the mixture until evenly incorporated. Add the blueberries and fold again until evenly distributed. 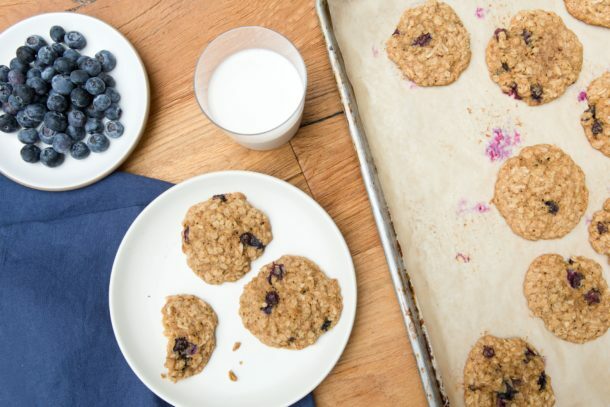 Scoop 1 ½ Tablespoons of cookie dough, shaping the dough with your hands to create a round ball, and place onto the prepared baking sheets, with about 1” of space in between each. Press down on each cookie to flatten slightly. Bake for 12-14 minutes, until slightly browned on the bottom. Cool for 2 minutes and then transfer cookies to a cooling rack. *If using GF flour, add ½ teaspoon of xanthan gum. Can we use all coconut sugar or do you have any suggestions if we don’t want to use cane sugar? You can try with all coconut sugar. The cookies will be darker. I suggest really creaming that butter and sugar together super well. Coconut sugar is drier and needs some help getting incorporated into the batter. These were wonderful. My husband and I ate probably a third of the batter before we even got them in the oven. The coconut sugar adds so much flavor. Eating cookie dough is half the fun in making cookies! These cookies were so yummy! We did not mind a bit the softer they got. My husband actually really loved how soft they got. I used up the rest of the blueberries I picked at the blueberry farm we have in Temecula. I love blueberries and just bought some more so I will be making these again soon. They did not last long here in our house.. I am also a sucker for oatmeal cookies so I was in heaven. Thank you! I am delighted to hear that. Thank you, Monica! Day old soft cookies sound perfect for ice cream sandwiches! Now that’s summer! As soon as I saw these I had a similar thought as your husband, but I was thinking WHITE chocolate. Dare I? ?